Ah, Baloonicorn, what would life be without you? The Baloonicorn, Pyro's pink fluffy bundle of hallucinogenic joy, has now reached the pinnacle of its evolution: plushie form. It won't be available until later this year, but for those who are prepared to take its message of peace and love to their bosom, there's an added bonus. Each plush comes with a coupon for Team Fortress 2 content; have Baloonicorn on your shelf, and also have it following you around in-game. Moreover it's not going to be the only plushie to come from the ingenious toymakers at German company Gaya Entertainment, which has partnered with Valve to come up with Pyro's fuzzy little friend. Gaya will be coming up with more Team Fortress 2 plushies, presumably each with item codes of their own, but no word yet on what or when. 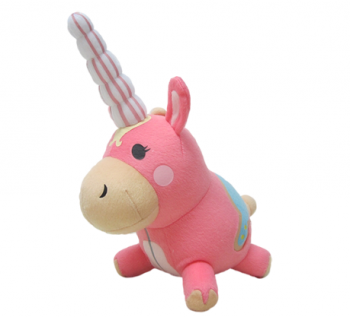 Recommended retail on Pyro's Baloonicorn is Â£24.99, (a touch under $40), and for those who care about such things, the little pink devil will be about 30cm tall, or 37cm from tip of horn to tip of tail. You'll have to wait until July 19th before Baloonicorn sees release, but if you want to know more, you could do worse than check out Gaya's site.